It looks like the bridge of the Starship Enterprise, and may still be in beta, but when it comes to Twitter it's hard to imagine anything TweetDeck can't do. Luckily its developers have better imaginations than we do, and they've added a whole bunch of new stuff to their program. 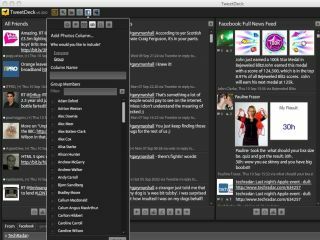 TweetDeck is no longer just about Twitter: it does Facebook and MySpace, too, and it's got some nifty new features. Here are seven things you'll love about TweetDeck 0.3. Social networks are a bit like chat networks: they're great when everyone is on the same service, but a bit of a pain if you're on MSN, they're on AOL and somebody else is on ICQ. TweetDeck helps solve that: as the "Tweet" bit of the name suggests it's a Twitter client, but it also enables you to follow friends on Facebook and MySpace, too. PROGRESS: Now you can annoy people on three social networks simultaneously. Hurrah for technology! When you've added Facebook and MySpace to TweetDeck, the status update field has three buttons on it: Facebook, your Twitter username and MySpace. Clicking on each button turns it on (white) or off (dark grey), and anything you type or drag in here will be sent to the services you've switched on - so you can post an update or picture to Facebook, MySpace and Twitter simultaneously. One of the best things about TweetDeck is the way in which you can create groups of Twitter contacts and then view them in different columns, so, for example, you could have one column for work contacts, one for friends and one for the celebs you're stalking. You can do much the same for Facebook contacts too: create a new Facebook column and when it says "Who would you like to include" select "Group". You can now give the column a name and specify which Facebook contacts it should include. TweetDeck's Compose Update box supports dragging and dropping, so if you drag a link from your web browser into the box it will automatically shorten it (assuming you haven't unticked Auto Shorten URLs). You can also drag and drop images. If you're posting to Twitter then TweetDeck will use a Twitter-friendly image upload service; if you're posting to Facebook it'll upload the image(s) directly. TweetDeck's Facebook support doesn't just mean that you get to read people's status updates. You can view and respond to wall posts, to photos, and to updates from those really annoying applications and games that infest Facebook. Little icons next to each update enable you to mark posts that you like or dislike, or to send a particular user a direct message. RATED: TweetDeck doesn't just show you Facebook feeds: you can interact, for example by commenting on posts or flagging items as "liked" or "disliked"
TweetDeck doesn't just enable you to view full Facebook content: you can filter it too. For example you can add a new Facebook column to display particular content - such as photos only, or wall posts - and then filter it so that only content from specific people is displayed. You can also filter columns for specific text, names, sources or times, or view the most popular content in a column. Looking for interesting people to follow? The new Directory groups prolific social networkers into topics such as environmental news, horror writers and so on. When you've found one that looks interesting, Add Column adds it to your TweetDeck line-up.